This 3?X4? 4 mil. ?Relock? reclosable bag holds four 3?X4? 4 mil. clear plastic bags. 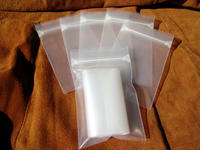 These bags are great for survival kits, spices, small goodies, AA batteries and what nots . We use them on all of our trips and find them to be as handy as fingers. Big enough for your hunting license. Water proof when closed and pretty tough too. NOTE: We will adjust the shipping rate.